One freakin’ wild movie and the high point of Tony Scott’s directing career. 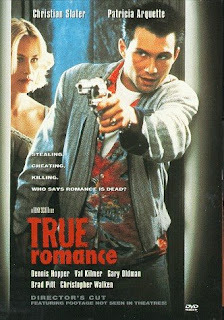 True Romance is about a lonely, endearing comic book nerd played by Christian Slater who falls in love and runs away with the world’s sweetest call girl played by Patricia Arquette. In the process, they kill her pimp (the great Gary Oldman in underwear and dreadlocks), accidentally steal a bag full of his cocaine, then drive across California to avoid getting killed by mob boss Christopher Walken so they can sell the coke and run away together. A movie for the whole family to enjoy. The cast in this movie is crazy. People must have really loved this script because absolutely everyone who was anyone in the early 1990s has a role in it. Aside from the ones I’ve already mentioned, it’s got Samuel L. Jackson for five minutes, Dennis Hopper in a surprisingly non-psychotic role, James Gandolfini before he started winning Emmys, and a young Brad Pitt in one of the best roles of his career, among others. The directing is good, it’s got a great score, and there are some great action scenes, but the real selling point to True Romance is the script by Quentin Tarantino. Anyone who’s seen a movie by Tarantino knows that aside from taking his movies from normal to insane at the flip of switch (this story is no exception), he’s all about cool, snappy, and atypically well-written dialogue that’s always delivered in a monologue/intense dialogue by the most badass people on the planet. Considering the cast at hand, there’s a lot of that going on, and it’s awesome. There’s also something very familiar about the story of True Romance. Even with everything that goes on, it manages to come out surprisingly simple and fresh. At the core of everything, this is a love story between two good characters, and, more importantly, it’s a relationship that you actually want to succeed. Might sound sappy, but it’s not. This movie is about as far from sappy as you can probably get. And while True Romance is easily the best movie that Scott has ever made, it isn’t the best thing that Tarantino’s ever written. It’s not as deep or edgy as you’d hope for and it doesn’t really stick with you in the way that his other movies do. But nonetheless, this is a good that hits the mark in a lot of places and it still has that Tarantino flair. Not exactly the best date movie, but it’s probably got more feminine appeal to it than guys getting their ears cut off in Reservoir Dogs. If anything, it’s a fun and exciting way to spend two hours.